Shuyang Lin has co-founded an innovation lab to open up the central government from within. “We can replace the entire government by AI in 500 years,” Taiwanese civil servant Shuyang Lin says. “I have no problem saying that”. In an AI government, there would be no civil servants, predicts Lin, co-founder of Taiwan’s government innovation lab, the Public Digital Innovation Space (PDIS). Technology would allow citizens to collectively make decisions, in place of top-down policymaking. Her radical beliefs and her role in the high ranks of the central government are not unusual in Taiwan. She was hired by Audrey Tang, the country’s “anarchist” Digital Minister. Lin is now spearheading a new kind of transparency and public participation in the Taiwanese Government. “We’re trying to decentralise the central government in a way, and trying to open the government from within,” she tells GovInsider. Taiwan’s new digital mission has strong links to the Sunflower Movement in 2014, when students and civic groups occupied parliament for 22 days in protest of a trade pact with China. Among those inside was Tang, then a self-taught programmer and civic hacker who helped livestream the protests to the public. The government and citizens were shaken up. “The society was ready to have a real deliberation among everyone in Taiwan,” Lin recalls. Two years later, Tang was made Digital Minister, and she hired Lin to “rethink” the government culture and design more open policymaking processes. Together, they set up PDIS. “The way we rethink this culture is very much surrounded in trust,” Lin says. Governments need three key elements to create change, she believes: open processes and technology; practitioners and civic groups who want to create change; and a social issue to bring them all together. Lin and her team use vTaiwan, a set of tools for public deliberation and decision making that were developed by Tang and other civic hackers after the Sunflower Movement. Every Wednesday, the government rents a space where citizens, practitioners, academics and civil servants come together to propose ideas to the government. Apart from the need to address a public issue, “there’s no agenda set from the beginning,” Lin adds. Participants must come from diverse backgrounds to ensure that every possible point of view is represented in the conversation. There are also no education or skills requirements; any citizen can be an expert. “If I’m a janitor, and if there’s a policy about cleaning or about housing, then I am one of the very key stakeholders to this issue,” she explains. 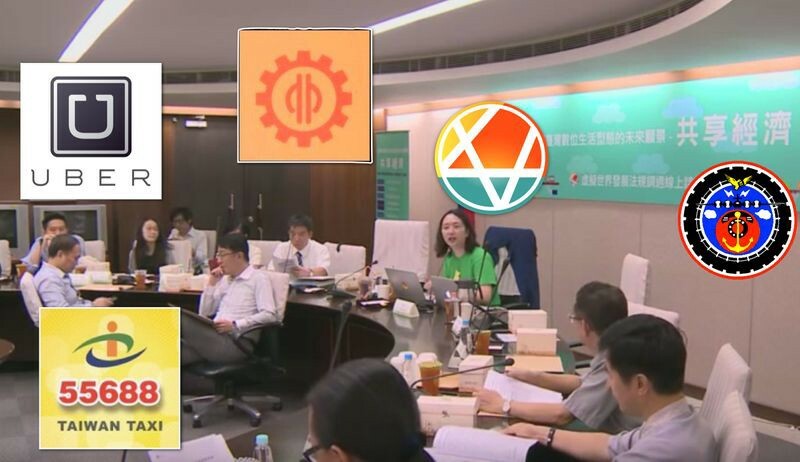 vTaiwan uses artificial intelligence to crowdsource opinions and draw consensus during these deliberations, allowing thousands of people to participate virtually. 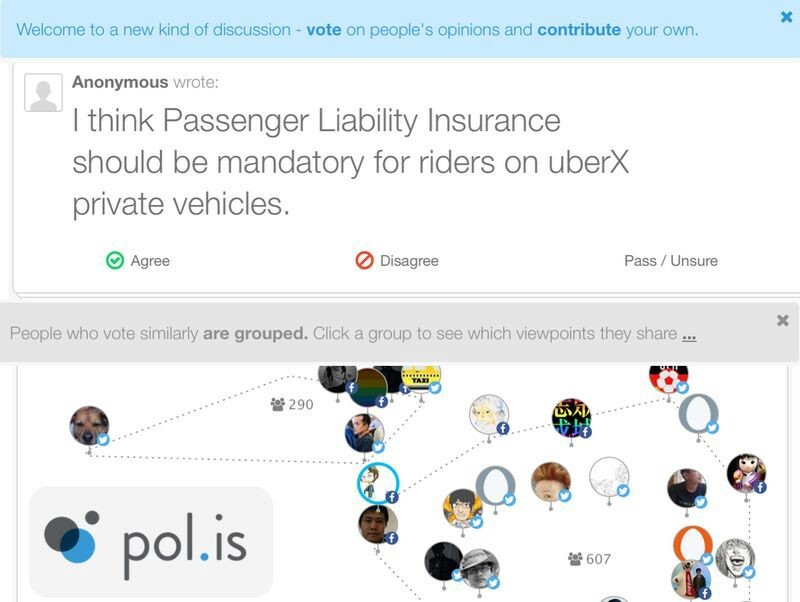 A tool called Pol.is is used to survey participants, who can vote to agree, disagree, pass or share their own comments for others to vote on. PDIS then invites online participants to face-to-face conversations to get people to start coming to agreements, which are recorded on Pol.is. Participants voting for similar opinions are gradually clustered into groups until specific consensus points can be drawn which the government agrees to enact. Taiwan first trialled this AI approach in 2015 during a discussion on how to regulate Uber. The government expected up to 4,000 people to take part, Lin says, including riders, taxi drivers, transport officials, academics and representatives of Uber itself. After nearly a year of deliberation using Pol.is, citizens came up with seven policies which the government pledged to ratify. The government agreed to allow taxi hailing apps like Uber to operate as long as they don’t undercut existing fare rates. Uber was required to pay local taxes, an issue on which it was locked in debates with several cities at the time. The company agreed to coach all its drivers and ensure they obtain professional driving permits. Meanwhile, local taxi associations agreed to cooperate with Uber. While cities across the world were struggling with angry taxi drivers and ill-prepared regulators, Taiwan had found a model to address it with public participation. Moving forward, Lin plans to use virtual or mixed reality and 3D modelling for local government deliberations. “We could deliberate visions of future urban plans while looking at the city,” Lin says as an example. Citizens could visualise plans as a digital layer on top of the real world, she explains. This would allow participation to be even more widespread, as citizens can see the models without having to attend meetings in person. The visualisations could also scale from a park to the entire city. “The goal is to make it enjoyable to participate in the deliberative process — like watching and acting in a 3D IMAX movie,” Minister Tang wrote in a blog post. The officials meet every week to discuss ideas submitted by citizens online through join.gov.tw. They identify petitions which have received at least 5,000 votes from citizens, or some times even fewer. They discuss one case every week, speaking to the petitioners, experts in the area, and other stakeholders before deciding how to respond. It is “very much decided by everyone included – it’s not just by very high ranking government officials”, Lin adds. In once such case last year, a finance ministry official picked a petition to improve the country’s tax reporting system. The citizens who submitted the petition and voted for it were UX designers, and worked with the government for months to make the national income tax filing system more user-friendly, Lin adds. “Now, you can see clearly how much money you have to pay for this year,” she says, with options to customise the system based on personal requirements. This approach has led to major changes in Taiwan’s digital service procurement. In the past, every government website or IT system had to be procured from a private company, with rigid standards mandated by the central government. Even a small design change on a website needed to go through a tender and could take up to two years, Lin says. Taiwan is now making design thinking a part of procurement, Lin says. The country is drawing from UK’s digital service standards to draft its own principles, with “design as one of the key phases before procurement”. Every department will come up with their own playbook for procurement based on these principles. While a government run by AI is still in the distant future, Taiwan has created a much more accessible model for governments to reinvent itself and regain citizens’ trust. Shuyang Lin will be speaking on Taiwan’s digital government innovation successes at Innovation Labs World on 25 September 2018 in Singapore. Registration is free for the public sector.